This was a funny year for Christmas gifts. The majority of the handmaking was done by my kids while I got my gifts on amazon. Or out of my oven. 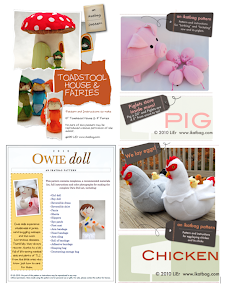 What about you - did you handmake this year? Earlier this winter, the kids started making known their preferences for Christmas gifts. One of Jenna's requests was a bag that she could color with markers, which surprised us since she already had two such color-it-yourself bags. 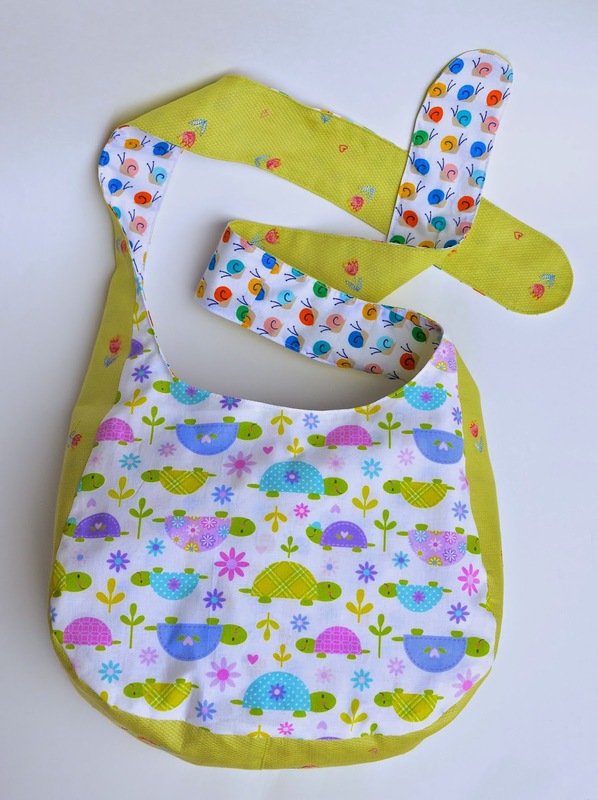 But those were small and more like handbags than true totes, so Emily decided to make her another one, in a more practical size. 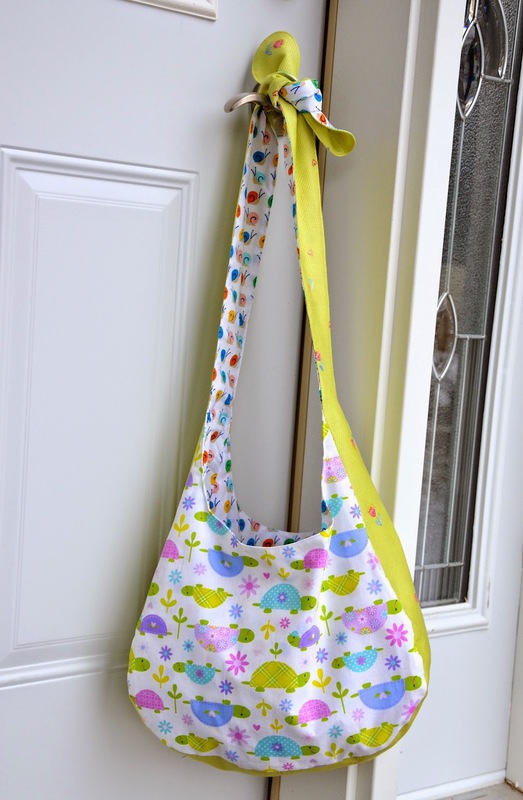 Since Emily was going to be sewing this bag, it had to be simple to put together, without interfacing, hardware, fiddly straps. Or raw edges that required serging or hemming, either of which would have been extra work. 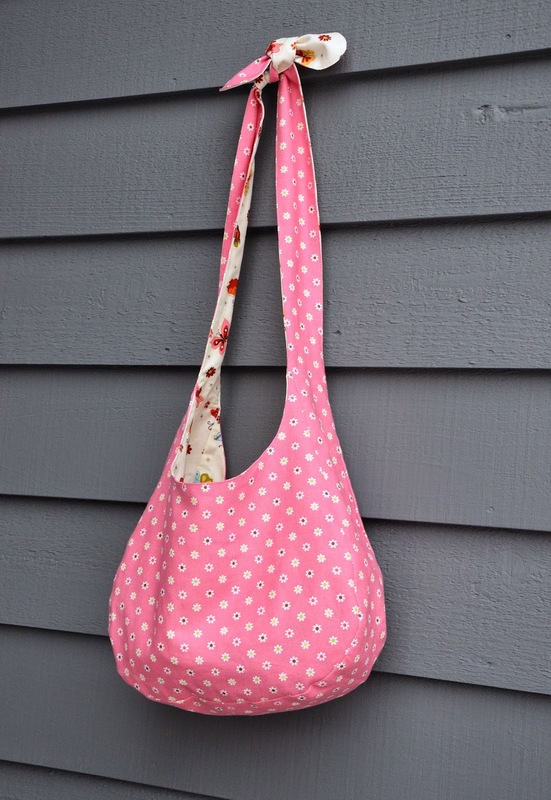 So I drafted a very basic - it took me mere minutes to draft - slouch bag. which ties at the shoulder. 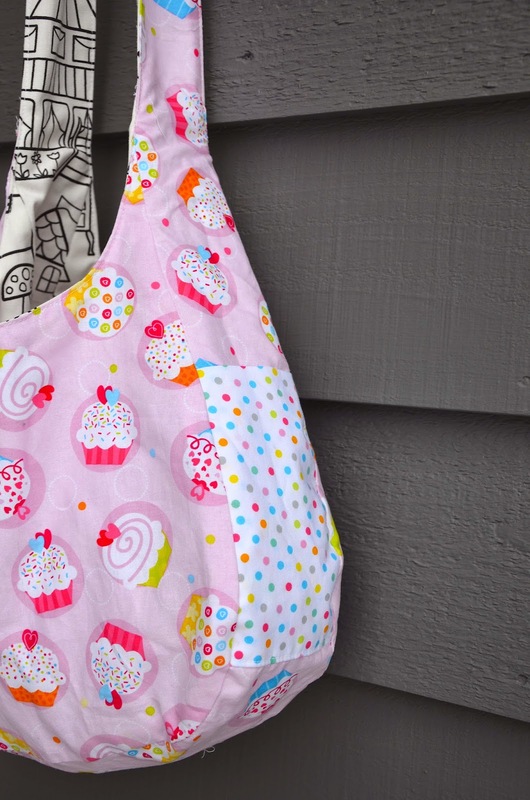 The reverse side is a cupcake-print quilting cotton with a contrast pocket. Because Jenna adores cupcakes. There were more curved than straight seams in this bag, but with basting, they were easy for even a 10-year-old to handle. 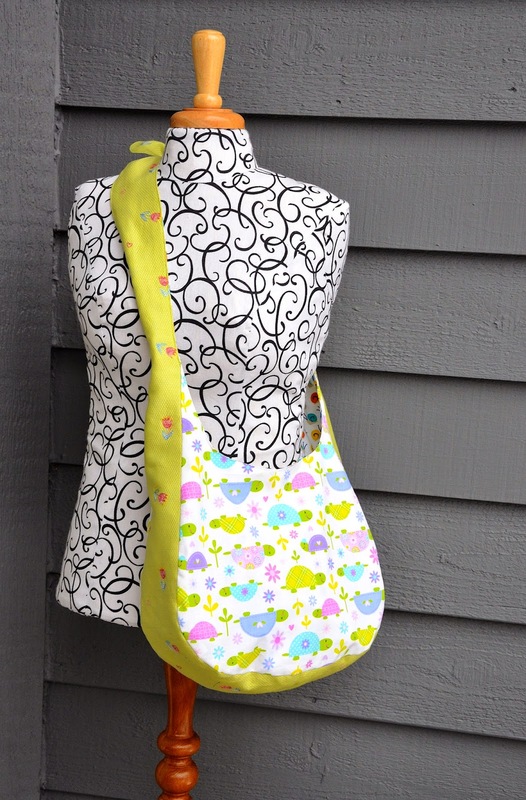 with a little gusset pocket. I'd love to be able to say that Emily was bitten by the mass-production bug and made bags for all the neighbors, her classmates and teachers, our newspaper delivery guy, and random cashiers at the supermarket, but the truth is that after sewing Jenna's bag and Kate's portable stable, she was done handmaking for the year. 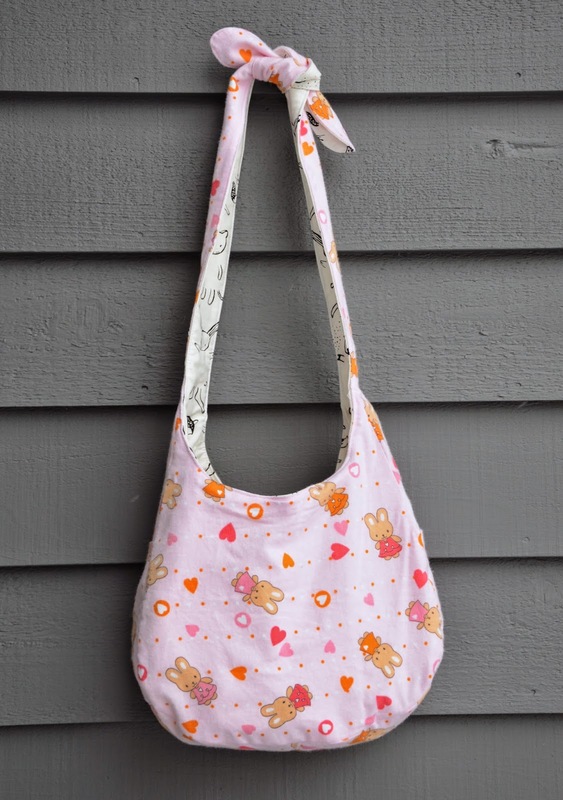 She said, "I really want to make myself a bag, because it's so cute, but I'm tired. Can you make me one instead?" 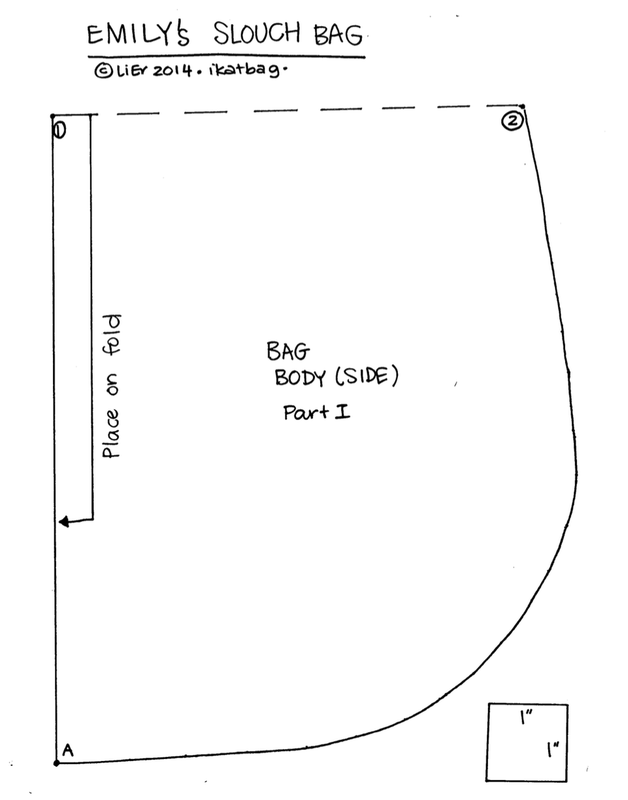 and a main-body patch pocket. Here is the bag modeled by Fleur for size. You can see that while the bag itself is decently roomy, the strap is too short for an adult because it was meant for a child. And unlike Emily, I have no problems mass-producing anything, so I made three more bags for gifts, and I took even more photos to show you some possible variations on the gusset-and-pocket construction. which makes the bag look rounder and smoother and not as segmented or angular as the ones with contrast gussets. I made a quilted base, though. For fun. Here's the other side - a patch pocket situated low just so I could align the print. 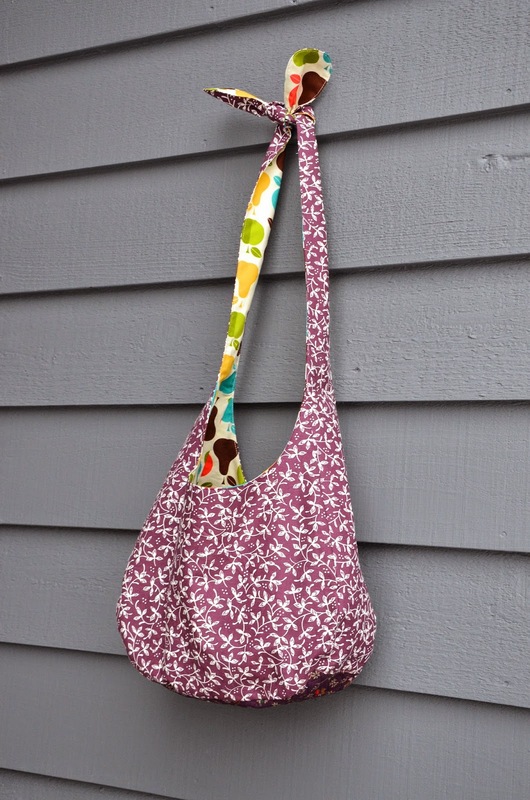 This side has a partial contrast gusset that has its gusset pockets integrated with the base. 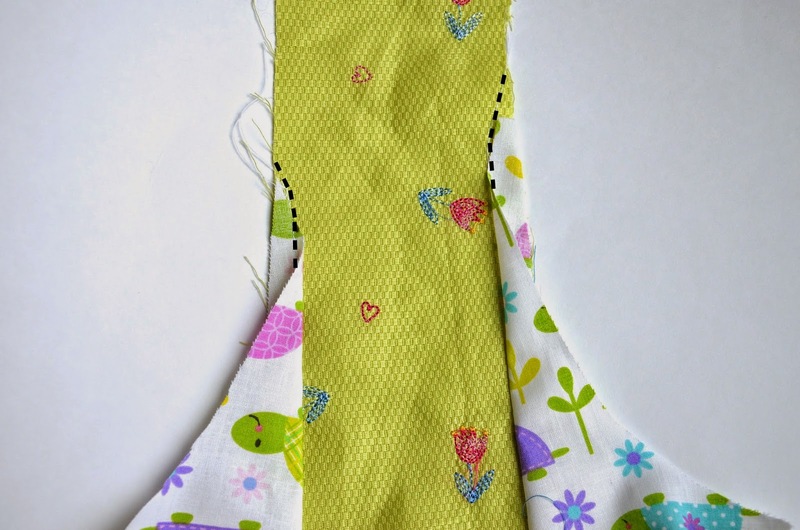 To do this, cut the base-and-pocket as one continuous strip, with the pocket double-layered and folded back onto itself. 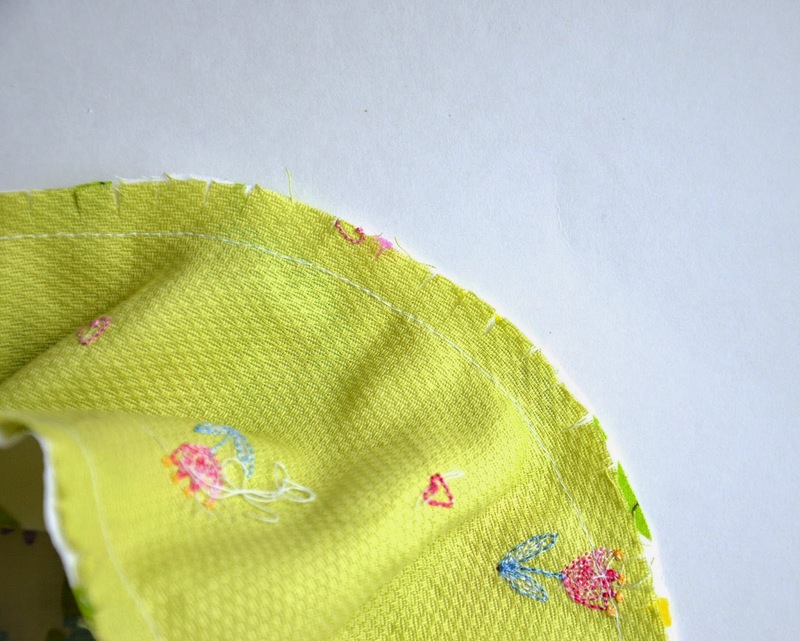 The top edge of the pocket is a fold, and the bottom edge of the pocket is merely a stitching line across both pocket layers, sealing the bottom seam. 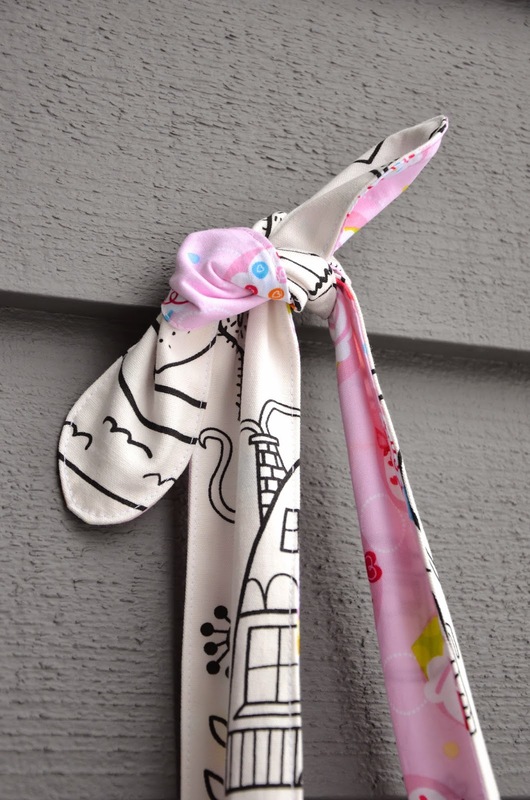 Then sew that onto the upper part of the strap. even the gusset pockets are of the same fabric. This pocket is a simple patch pocket - cut double-layered and folded on itself over the top edge. The bottom seam edge is serged (this is the only place where there is serging in this bag) and folded inwards, then topstitched down. 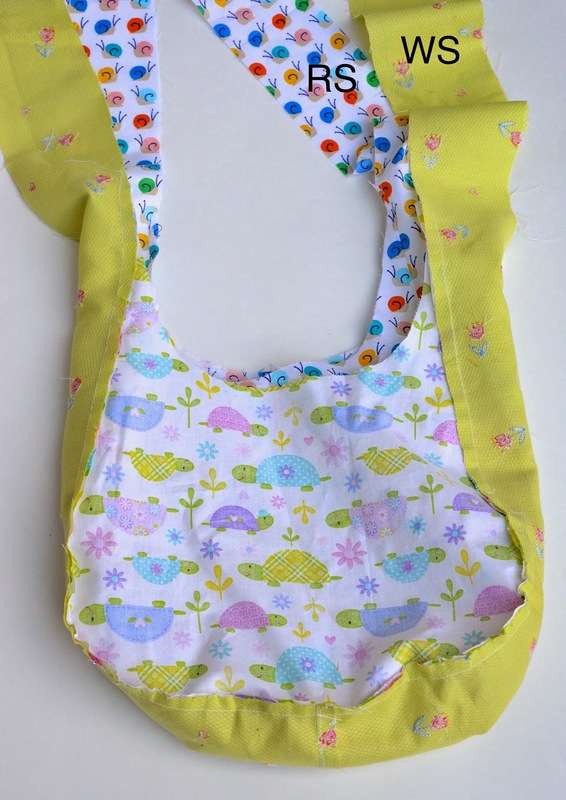 This is the other side - again, when made entirely in one fabric, it looks rounder and smoother. 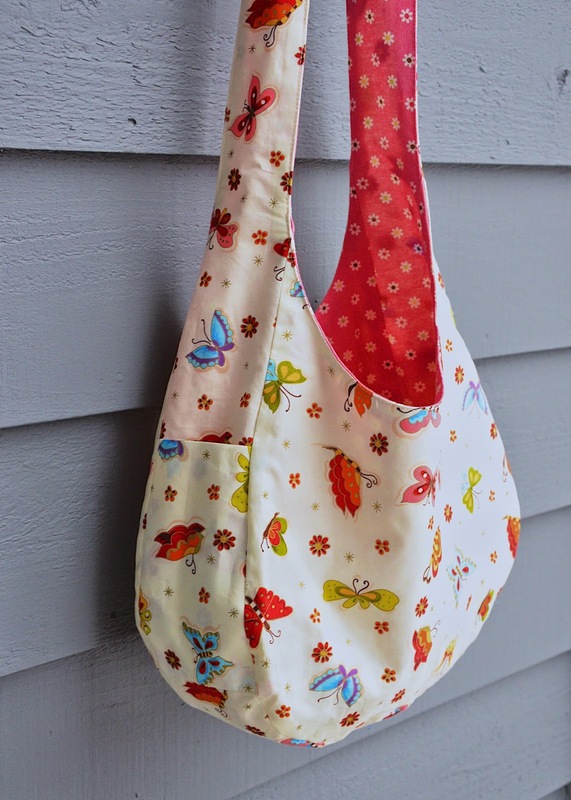 This side has a patch gusset pocket that is attached the same way as the one in the butterfly fabric. The other side also has a contrast gussset. 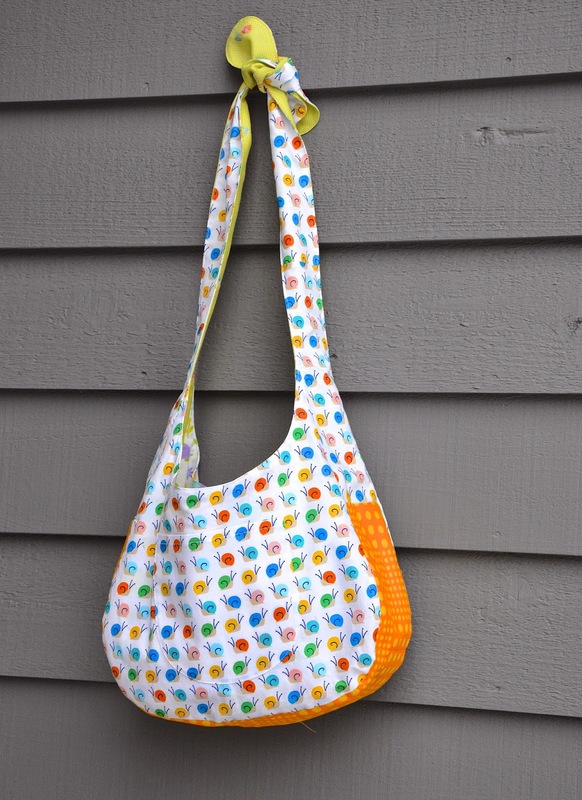 As our Christmas gift, here is the pattern and tutorial! 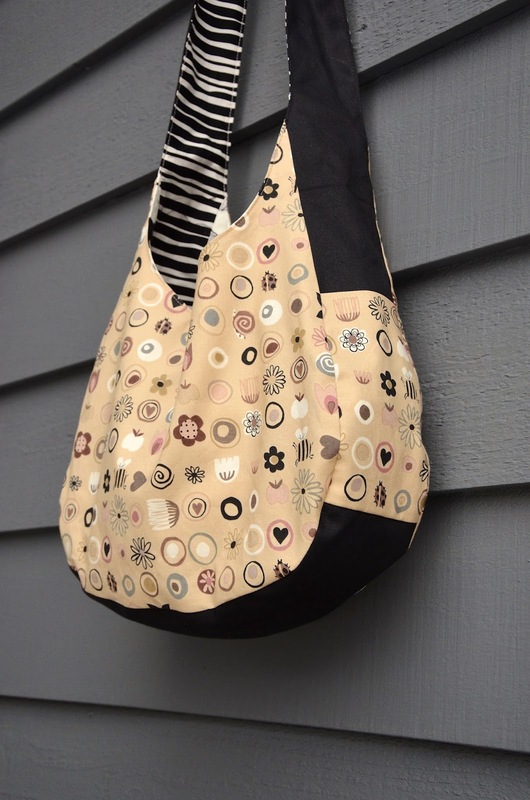 This is a really fun and fast bag to make, and we love its lines and shape - all curvy and cute. It's simple enough for even a 10-year-old. So dig into your quilting cotton stash and go crazy! Gentle reminder: this pattern, as with all my patterns and tutorials, is for personal and non-commercial use only. 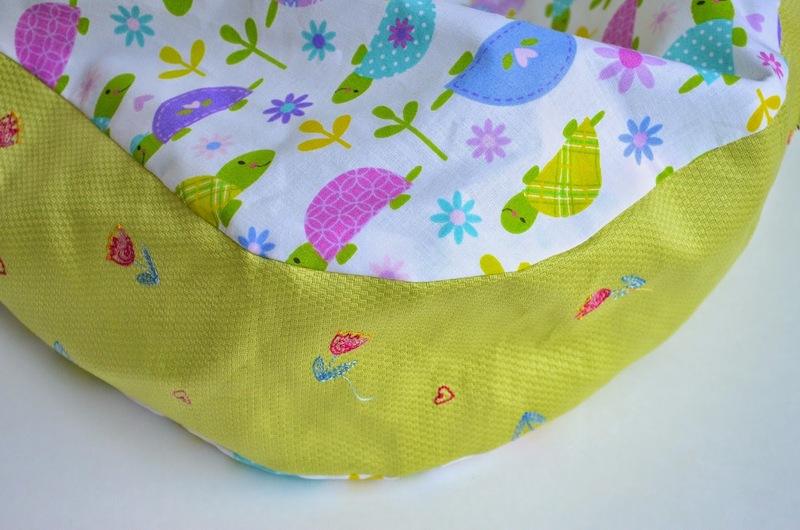 Remember that my patterns/templates never have seam allowances, so please add your own around all edges except where that edge is placed on the fold of the fabric. I recommend 1/2" for bags. Because of the extra bulk at the junction of Point B (see template for this to make sense), the best fabric to use is quilting cotton or home-dec fabric for one of the layers (and quilting cotton for the other). Do not use anything heavier than home-dec, and avoid duckcloth. 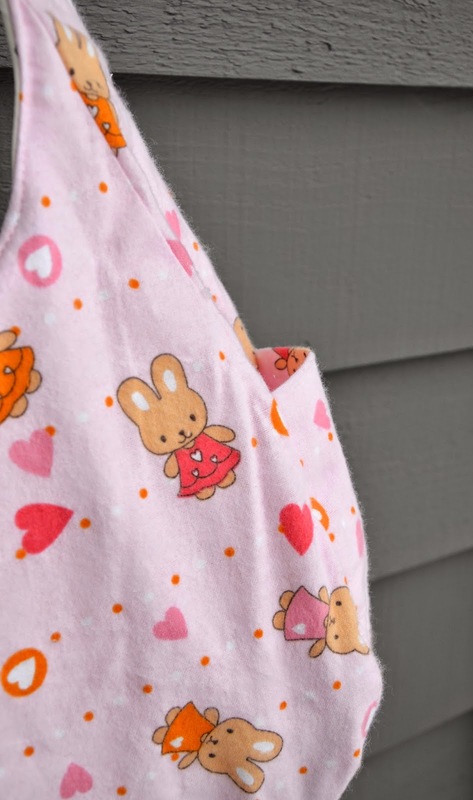 Also don't bother with interfacing; this is a slouch bag, so it's meant to be floppy and soft and interfacing makes the knot at the shoulder too bulky to tie. 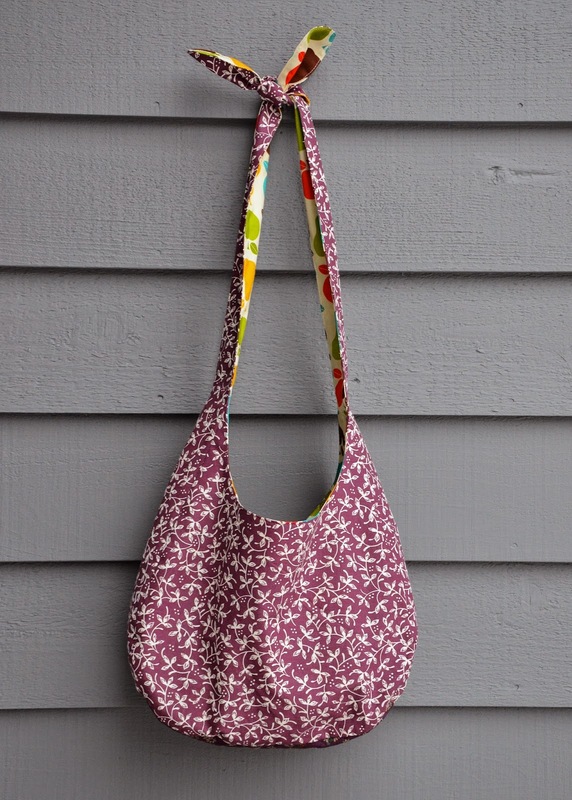 You can, however, interface or quilt the base portion of the gusset - the wine-colored calico bag in the above photos shows this variation. 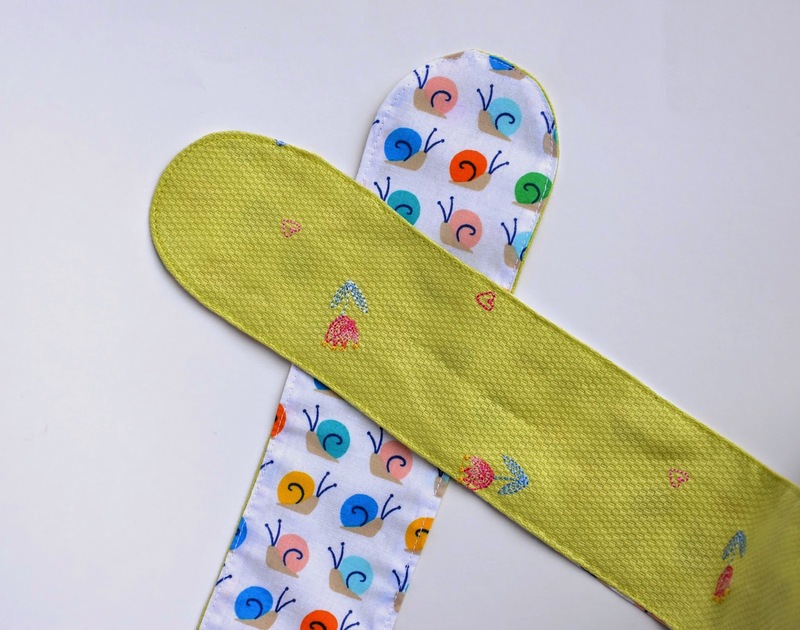 There is lot of pressing involved, so if you are making this with your youngish kid, be prepared to do all the pressing for him/her if they are too young to be safe around an iron. The strap templates need to be pasted together with tape, and can be lengthened for taller users (e.g. adults) - the pattern sheet gives some suggested dimensions and instructions, but feel free to adjust these to fit your needs. There are reference lines on the straps to show you where to position the gusset pocket. 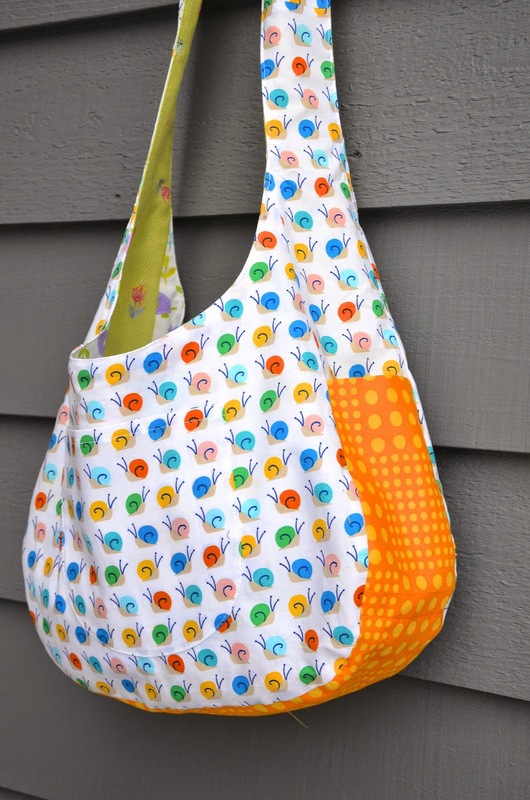 Yardage-wise, I'd estimate a yard for each side (layer) of the bag to be safe; half a yard is too little and three-quarters is iffy, depending on how long you want your strap to be or whether you are making the entire side in that one fabric, or piecing a contrast gusset of another fabric. 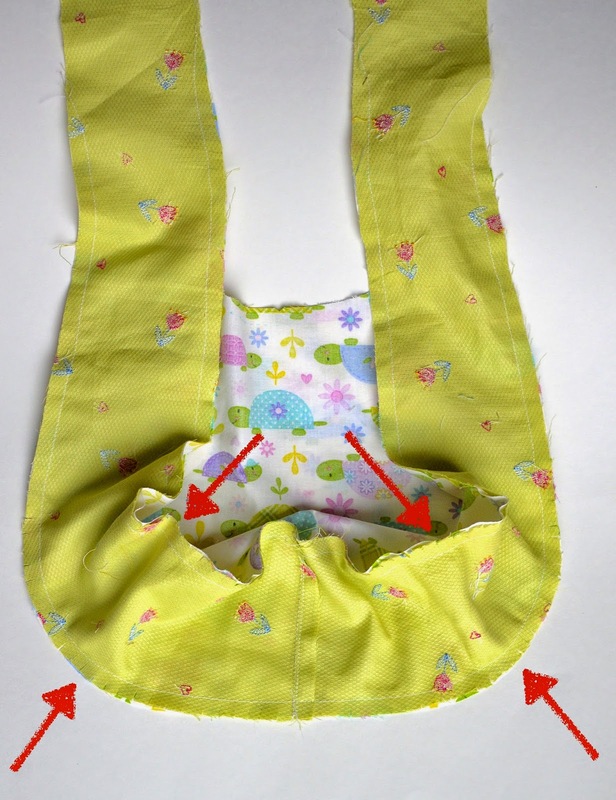 For each SIDE (layer) of the bag, you'll need to cut two body pieces and two strap pieces, which you should then join at the center seam AA to get a very long strap with both ends rounded where they will tie into a knot. Piece the gusset into one continuous strip. 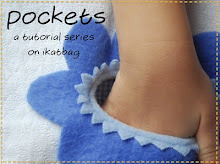 If you want pockets, sew them on now. 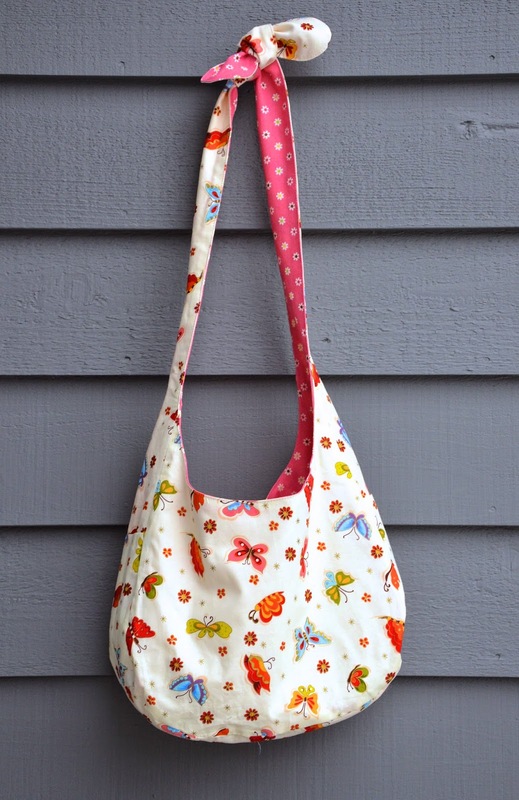 Their sides will be sewn, along with the gusset to which they are attached, to the main body of the bag. Attach the gusset to the main body pieces, one at a time. Line up the mid-seam AA of the entire gusset with the midpoint A of each of the main body pieces. I like to sew the gusset from A to B in each direction, instead of sewing from B to B through A. This way, I am sure that the midpoints A will match up. 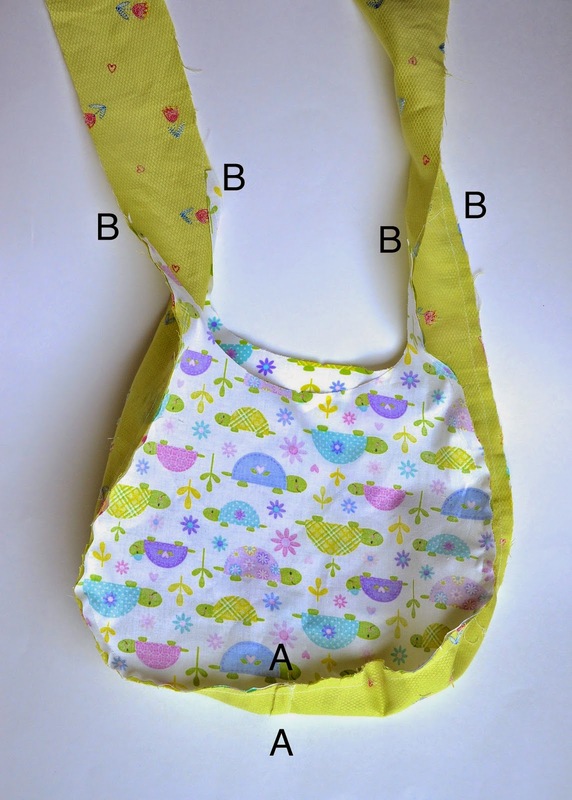 You might prefer to match up the B points on gusset and main body and sew from B to B through A. Remember to leave an opening in one of the layers for turning out later. I left my opening (about 4"-5" around point A because it is straightest there and easier to handstitch closed later. 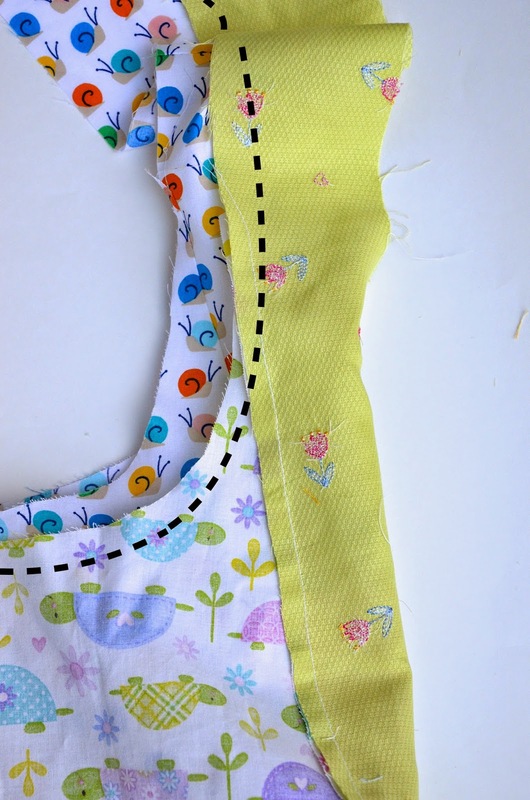 Here are some tips for sewing the gusset onto the main body. Clip halfway through the gusset's SA in the section that goes around the curved corners of the main body (see red arrows). to produce a beautiful and smooth corner. I don't pin or baste my rounded corners, incidentally - I just clip the SA and ease the fabric around the corners - fast, and effective. Another tip for getting that junction at point B to merge beautifully when you sew both bag layers together later: When your stitches run off the main body, taper them off to the edge of the gusset as shown by the black dashed lines. They'll be hidden within the SA of the gusset later. Don't be alarmed if your junctions are uneven like mine - see: one is higher than the other. Do I care? Am I freaking out? No. They'll still be symmetrical on each side of the bag. Turn one layer RS out and insert that into the other layer, which is left WS out. The RS of both layers should be together. 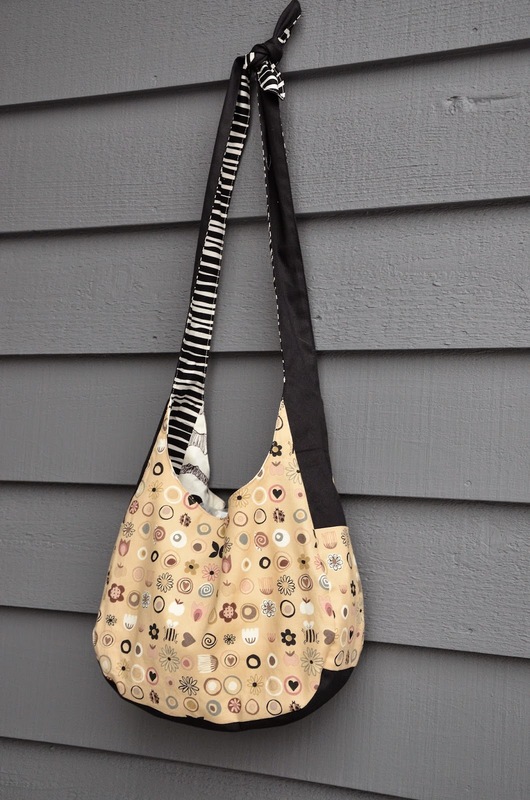 Line up the edges and sew all around the edges of the straps and opening of the bag to attach the layers together. Here is how you'll be sewing in that junction B area. Remember the stitches running off towards the edge of the gusset? You can see them in white in the photo below. Now when you sew the layers together along the black dashed line, those stitches will be hidden within the SA of the gusset. And those junction B's will be beautiful and smooth. Turn entire bag RS out through the opening you left in Step 2, press the seams and edgestitch all around the straps and bag opening. Handstitch shut the small opening. and tie them into a knot. 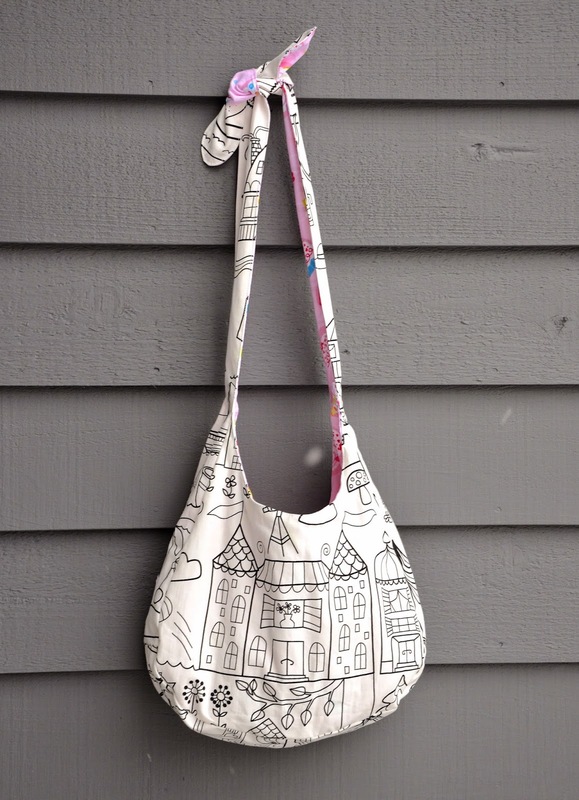 I love using that Ikea fabric for colouring projects. Thank you for the pattern and the explanation. Your present was well received here. 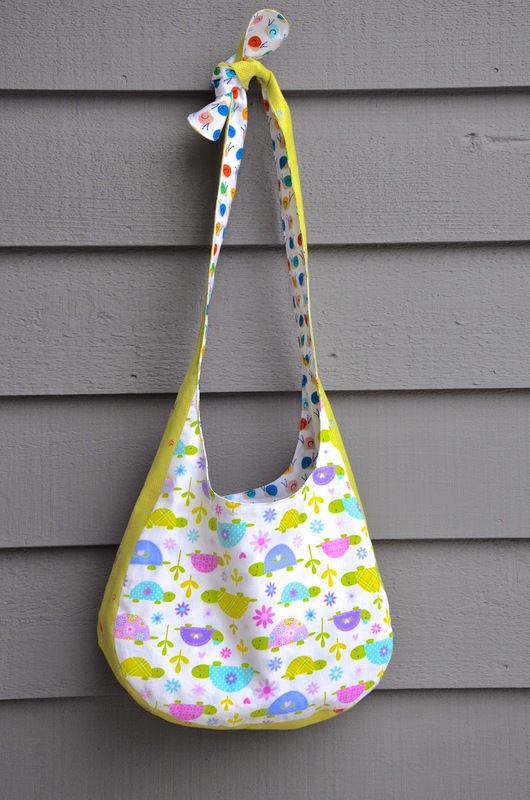 Two weeks ago my daughter wanted to sew a bag, so i showed Emily's, big yes to that pattern. We made made one together and have finished it this evening. It's going to be the new school bag. 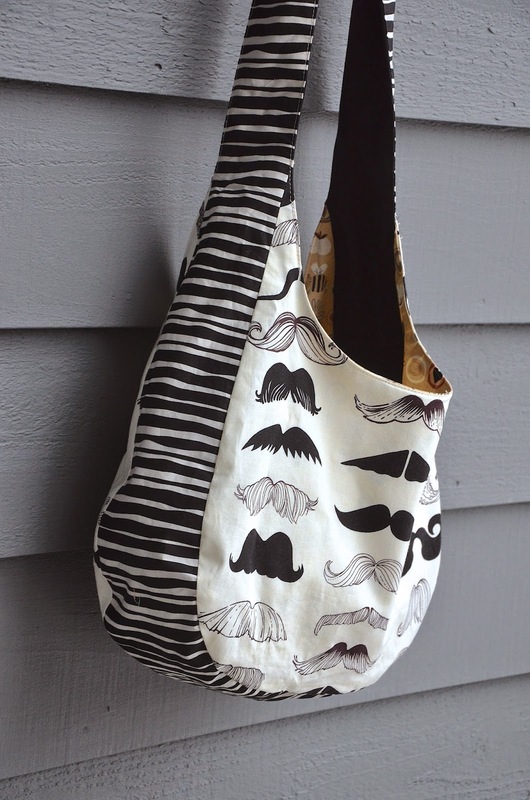 What a fun bunch of bags! I love the idea of having one side to color! Emily's becoming quite the seamstress! I just discovered your blog this year and am enjoying all the posts! 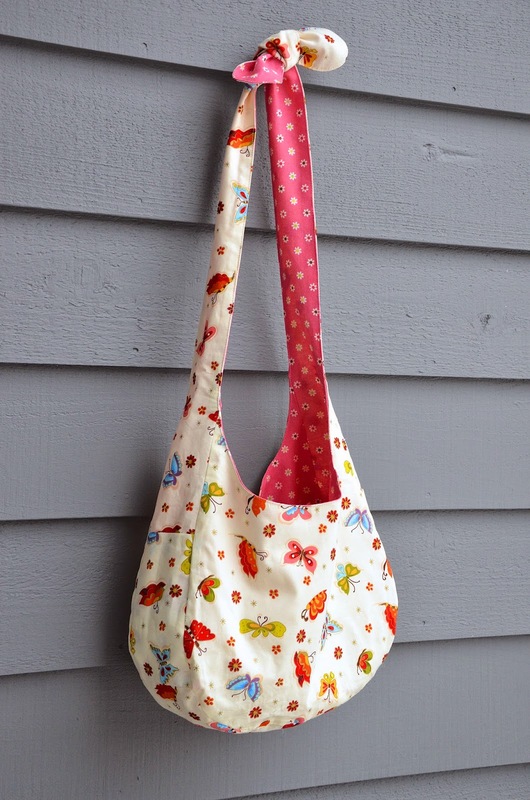 I love making bags, and will add this to my pattern collection. 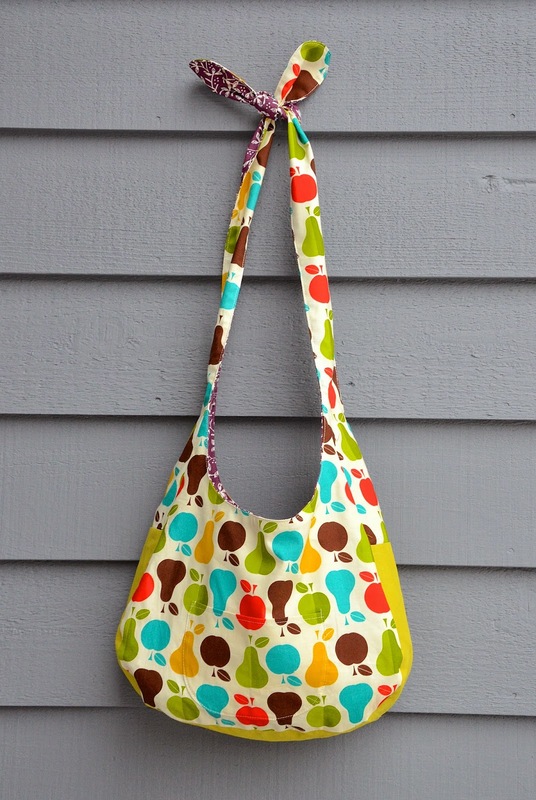 I can envision project bags for my knitting projects...thank you and happy Christmas. 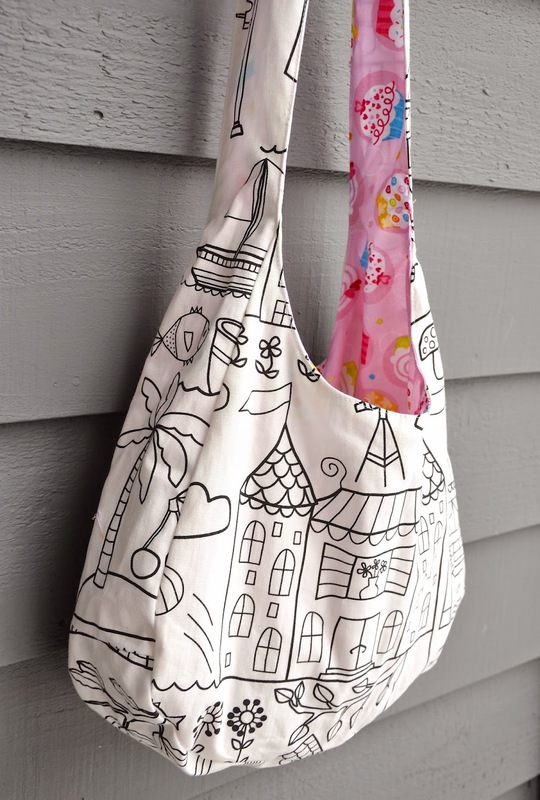 What a great idea - a bag for a child to sew and then colour. Thanks for the pattern. I did one sewing project for Christmas: I used your circle skirt tutorial from 2009 to make a twirly Christmas skirt for my daughter! I neglected to get her a Christmas dress this year and was guilted into making up for it. Finished in a day! What a lovely project. I think it's fabulous that your girls are making presents for each other. 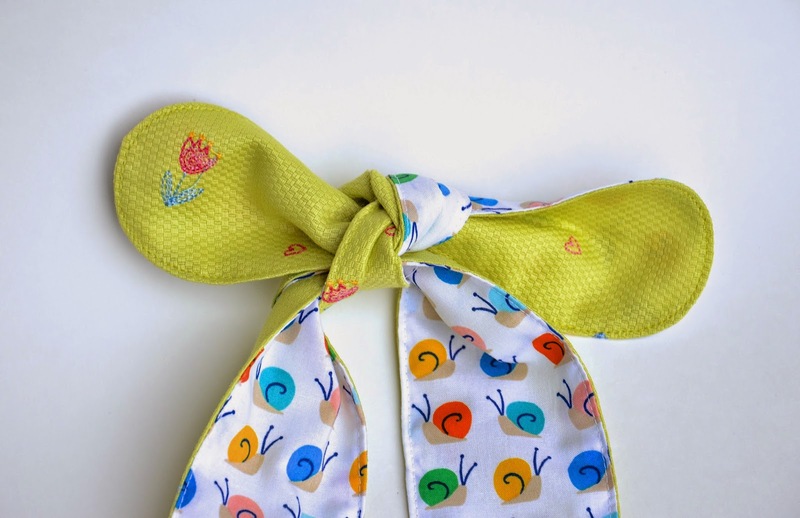 Sewing is such a lovely skill to share with your children. Thanks for sharing the pattern. 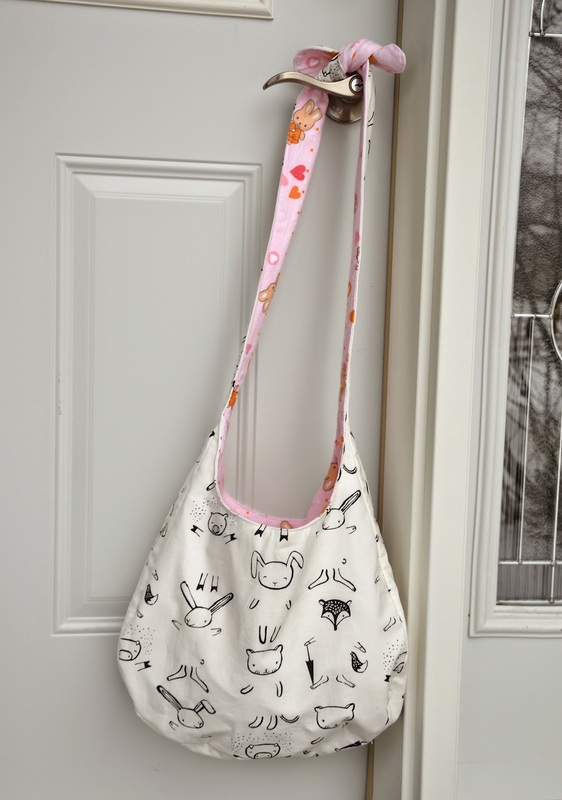 I'm not sure we need any more bags in this house, but I can see this making a lovely gift along with some fabric markers. I was hoping you would include the pattern! 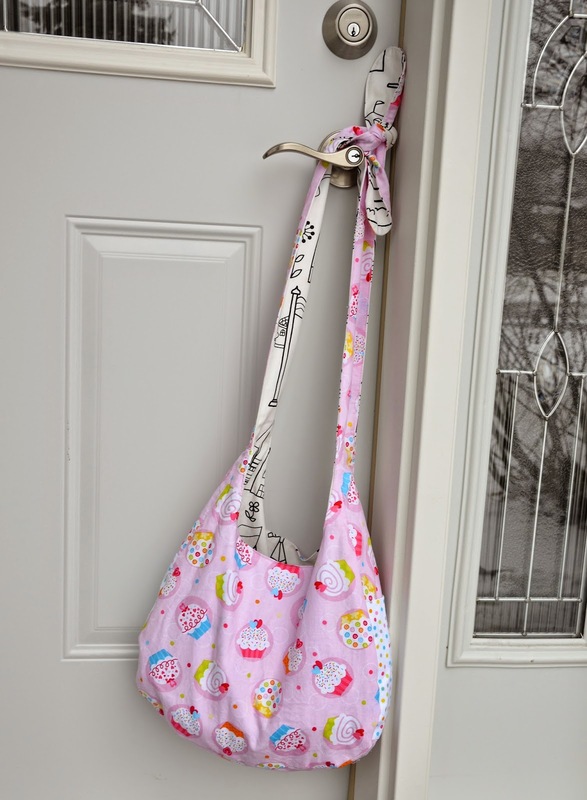 I could see all three of my girls loving this bag! I hope you had a wonderful Christmas with your family. Happy New Year! 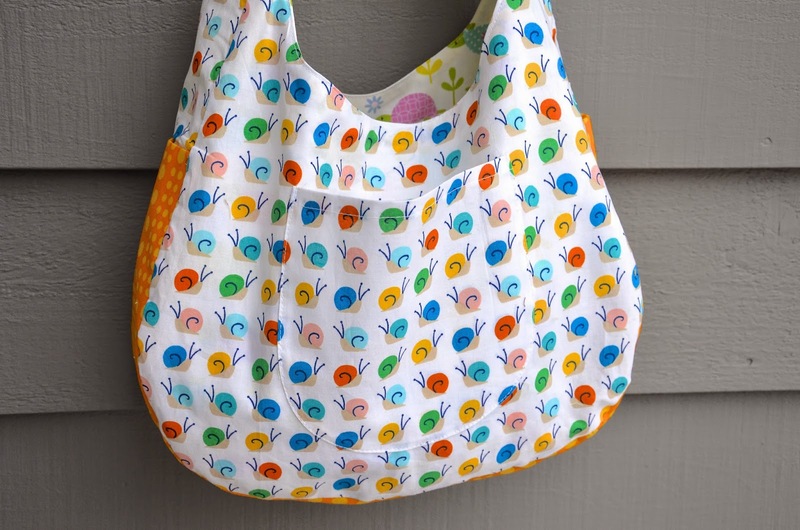 Adorable bag, thanks for the pattern. I'll be sewing one up with my 9 yr old during the break from school! 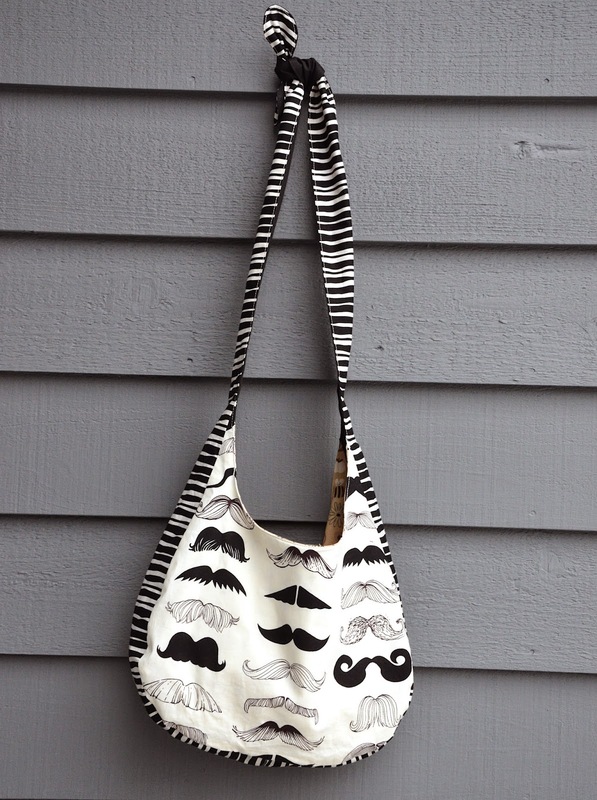 I love the bags that you made. Thanks for sharing your pattern. I wasn't half as organised as I would have liked to have been on the handmaking this year but one of your tutorials was a lifesaver when I got stuck in the middle of a wallet making project. This is a really cute project - thanks! I just opened this post and am delighted to receive your gracious gift! muchisimas gracias!! 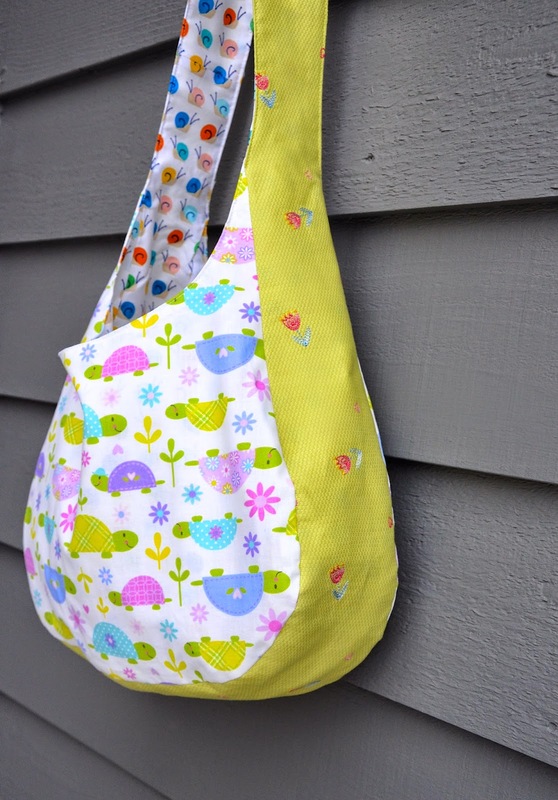 I think my little girls are going to love some slouchy bags. I'm going to let them pick out their own fabrics too. 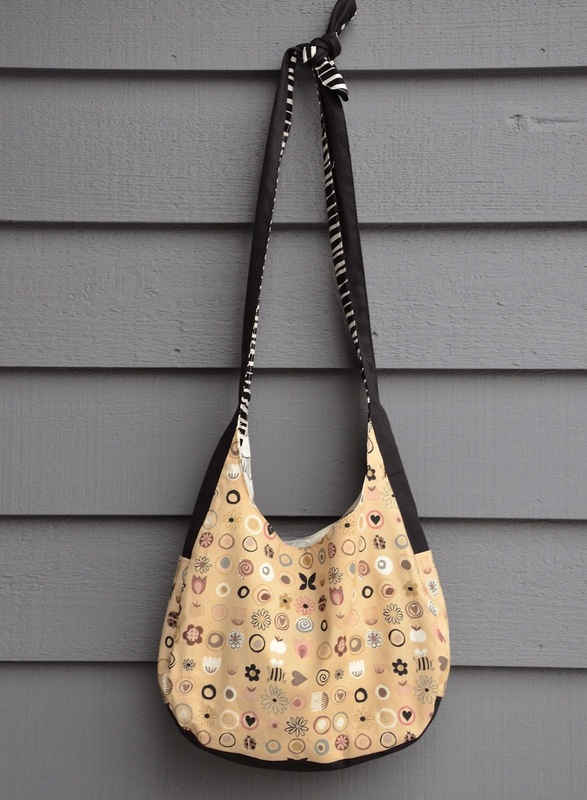 Such a simple tote (when explained by you) and your pattern. This was a wonderful little gift today, just what I needed to keep me happily busy this weekend. Thank you, Emily!! What a fantastic gift for your sisters. And thank you, LiEr! I am excited to try this bag out. What sweet girls you have to make such wonderful gifts for each other. The girls have already been using theirs to haul their stuff around. It'll make a great library tote. 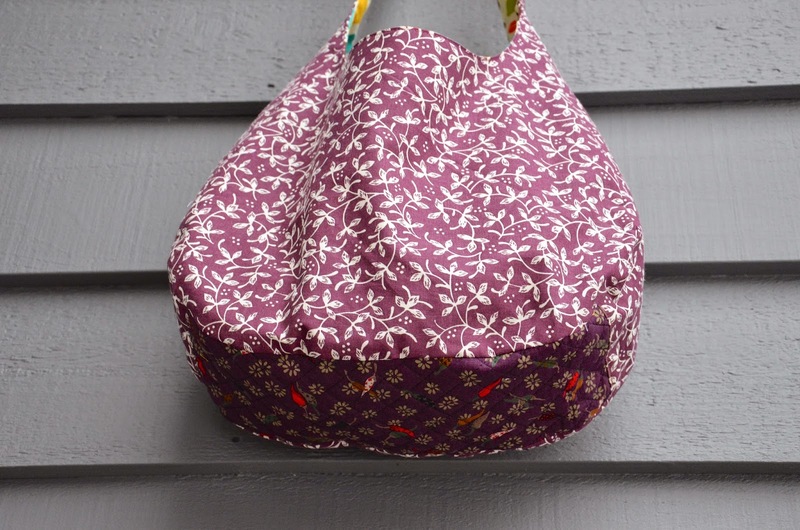 How many yards of fabric does it take to make one bag? Crystalfaith R: No idea, actually! You'd have to print out the pattern and estimate from there. 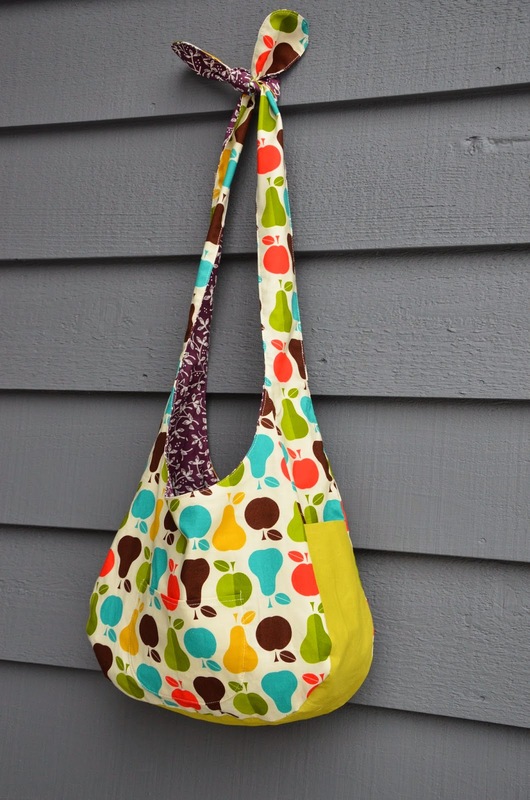 It also depends on whether you're making the bag with only one fabric i.e. both layers are the same fabric or not. I'd go as far as to say that one yard for each layer is PLENTY. Ok is the body ws together to begin ? Kourtni - the pieces are RS together at the start. Anonymous: I just tried the download link and it worked perfectly. Deid: yes, you could put a zipper in.